2015/03/31 Wow: is this the most expensive new TLD sale yet? 2009/05/20 Why do young Romanians speak English so well? 2009/04/19 New film looks at English learning in "trilingual powerhouse"
One gateway of the latter kind is EnglishClub (www.englishclub.com). Don't be intimidated by the apparently overwhelming homepage and its optimized layout. Instead study the page at your leisure. It has a clear system. In the centre of the homepage, you will see clickable icons depicting buildings. In the two columns to the far left and right respectively, you will find more links. Click the various alternatives and see what is on offer. If you know what you are looking for you can use the website's own internal search engine at the top of the page. If you want a quick overview of the contents, you can browse the two scrolling menus located just underneath the advertising window beneath the website logo. One of the menus is for learners, the other one is for teachers. 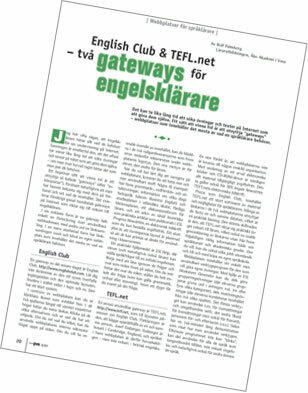 Another useful gateway is TEFL.net (www.tefl.net), the layout of which reminds one of EnglishClub. The explanation is that both sites are maintained by one and the same person, Josef Essberger. Essberger is resident at Cambridge, UK, and the language on his websites is therefore mainly - but not exclusively - British English. Just like EnglishClub, TEFL.net contains a large selection of materials and possibilities for the language teacher. Many of the links on the two websites in fact make use of one and the same database, which is a practical solution. The most important difference is that TEFL.net is practically intended for teachers only, which becomes clear by a quick scan of the links. In consequence there is a wealth of information on language courses as well as academic degrees. If you like, you can apply for a job abroad, or buy your own language school. I'd like to say a big THANK YOU to all the students, teachers and international language organizations who have supported EnglishClub during the past 10 years. Yes, 07/07/07 sees EnglishClub's 10th birthday! Thanks to your support EnglishClub has grown into one of the largest ESL communities on the web, with over 1,000,000 visits from students and teachers monthly. Over the past 10 years, responding to feedback from our members and visitors, EnglishClub has continued to develop and provide students and teachers world-wide with the resources they need in learning or teaching English. We look forward to the next decade, confident in your support and eager to continue innovating the tools and resources you need to succeed. This comprehensive English language site is definitely worth a visit if you are serious about improving your English. It has all the standard features of a good English language site, including sections on grammar, idiom, spelling and general use of the language. It also has some excellent and innovative features, such as a karaoke lounge, where you can pick out a song that you like, and have it stream into your computer while the text appears at the bottom of the screen! There is also a very useful section on business English with topics such as writing a business letter or putting together a resume. The site is clean and well designed and is very fast to load, although you will need a reasonable connection if you want to be able to sing the songs. EnglishClub Voted "Best ESL Site"
CAMBRIDGE, ENGLAND - January 30, 2002 (INB) -- In a survey of 7,000 English language students and teachers conducted by Study Saint, the 100% free-access EnglishClub was ranked #1 out of 10 leading EFL/ESL internet sites. Mathew Ridyard, inventor of the Study Saint internet organizer for English learners, presented the Golden Halo Award for "Best English Language Site in the World" to EnglishClub founder Josef Essberger, saying: "Congratulations! EnglishClub has overwhelmingly been voted the Study Saint user's popular choice. From a total poll of 7,000 votes, EnglishClub was preferred by 28% of the voters. A remarkable achievement." Participants in the online survey were asked to choose their favorite EFL/ESL website and invited to add comments like: "EnglishClub is always my confidential friend. When I have any troubles with English...I go to this site to research and study." "EnglishClub is not only something great for students but it is something great with its tips for young teachers like me." "English changes my life. Keep on practicing English. You'll get everything different than before. Trust me and believe. Be at EnglishClub or be behind!" "EnglishClub is a heaven for English learners all over the world." Founded in 1997 by Josef Essberger, an English-born writer/photographer and RSA/TEFLA teacher with 10 years' experience teaching English in Europe and Asia, EnglishClub is a Cambridge, England site that has quickly developed into one of the leading language instruction sites on the Web. "I think of EnglishClub as a real 'club' that belongs to the visitors, who can participate online in a friendly environment that encourages 'learning by doing'," explains Josef Essberger, who sees no conflict between free online sites like EnglishClub and conventional language schools and publishers. "In fact, we actively encourage learners to develop their skills in language schools through pages like the EnglishClub Language Holidays Directory. And many schools and ELT publishers sponsor EnglishClub because it reaches English learners in practically all countries. I see EnglishClub as providing the environment to foster a genuine love of learning English. I've put tremendous effort into making it a site with real educational content that is still easy and fun to use. The emphasis is on the learner rather than the teacher, on learning, not teaching." EnglishClub has 24 main sections covering the four language skills plus grammar, vocabulary and pronunciation, as well as interactive areas such as eFriends, Forum and Chat, and special sections for teachers. Its 24-hour HelpDesk is loved by students who ask grammar questions online and receive answers from HelpDesk Teachers such as Alan Bunyan in Japan or Sandra Goronas in Argentina. One of its most popular email services is "7 Secrets for EFL/ESL Students". Overall, EnglishClub attracts over 120,000 monthly visitors, logging about 1.5 million pageviews. LONDON, ENGLAND - October 4, 2000 (INB) -- Until recently, many people desiring to learn how to write and speak English fluently had to pay big bucks to a foreign language center, or learn the language during their formal school years. Once again the Internet has changed the rules and birthed a fun, inexpensive and free online alternative: EnglishClub www.englishclub.com. Offering over 5,000 pages, EnglishClub has developed into one of the leading foreign language instruction sites on the Web in terms of quality content, size, format and popularity since its November 1997 debut. Updated daily, the web site is regularly visited by over 70,000 visitors each month who log in more than 400,000 page views. It has been designed to assist both ESL (English as a Second Language) and EFL (English as a Foreign Language) students and teachers. "We think of ourselves as a 'club' - not a 'school' - where both students and English teachers from around the world can learn English in a friendly environment that encourages involvement," explains Josef Essberger, founder. "We've put enormous effort into making EnglishClub a site with all ESL/EFL educational content. It's also full of simple-to-access pages requiring no special software. That explains why thousands of sites around the world link to us." 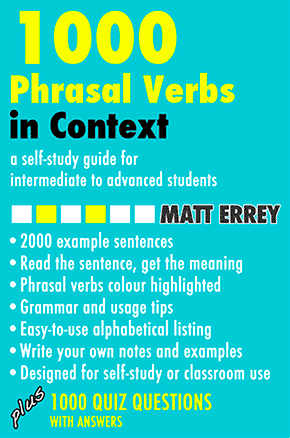 Grammar - The most popular; provides help and tutorials on everything from tenses to prepositions. Vocabulary - Great "real life" examples of 20 words/definitions commonly associated with various industries or subjects (e.g., advertising, publishing, resumes). Reference - An extensive library covering rules for English, irregular verbs, and the like. Also offers various levels of English language tests to assess your progress. Business - Perfect for the professional or adult student needing info on money matters, news/seminars, and advice on creating resumes and presentations properly. Teachers' Room - Stress-free zone for busy teachers providing classroom activities and resources. Language Holidays - An extensive database of schools offering "study abroad" English-language courses. 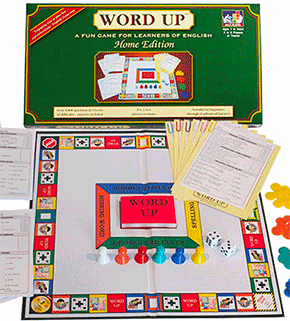 Fun - Aptly named, it offers word games, quizzes and jokes. Forums - Kick back and hone your emerging language skills by chatting in English or joining a discussion with new friends, or finding penpals from around the globe. Shop - View thousands of books, CDs, tapes, videos and other materials carefully chosen to help you improve your English skills. Additionally, members can sign up to receive EnglishClub's free "Progress!" newsletter full of helpful articles, online study tips and quizzes. The site also takes and answers individual questions from members about the English language and the Internet, and offers a custom-designed search engine for finding other sites relating to the learning and teaching of English. Since EnglishClub operates from Cambridge, UK, the site is written in "British" English and uses The Concise Oxford Dictionary of Current English as its main reference. "However, we do have pages relating to other varieties of English," explains Essberger, adding that Webster's New World College Dictionary, for example, is the primary reference for American English. EnglishClub is an independent site wholly owned and operated by Essberger, an English-born writer/photographer. He also is a former RSA/TEFLA English teacher with over ten-years of experience teaching ESL and EFL to all ages and levels in both Asia and Europe. Funding for the site is derived from advertising and sales of products from its online store. EnglishClub constituye una de las mejores webs para ayudarte en el aprendizaje de la lengua inglesa. Ya seas profesor de la materia o alumno de la misma, en este site podrás estudiar gramática, vocabulario y pronunciación, jugar a diferentes juegos, discutir cualquier cosa con otros alumnos y profesores de diferentes partes del mundo, encontrar información sobre cursos de inglés en el extranjero, hacer amigos para mantener correspondencia, encontrar ayudas para mejorar tus conocimientos y ponerte a prueba a ti mismo mediante los tests. La web, que se encuentra totalmente escrita en inglés, abarca las siguientes secciones: Gramática, Vocabulario, Juegos, Centro de Ayuda, Vacaciones lingüísticas, Negocios, Foro, Recursos y el rincón del Profesor. Además, podrás suscribirte a sus boletines, recibir por e-mail los siete secretos para aprender inglés fácilmente y entrar en una guía de webs relacionadas con la enseñanza de inglés. EnglishClub elegido como Mejor "Sitio Del Lenguaje Ingles"
Encuesta On-Line de los 10 sitios principales para los estudiantes del lenguaje Ingles, clasifica el sitio libre englishclub.com como el Número 1 del aprendizaje online. CAMBRIDGE, INGLATERRA &horbar; 4 de Febrero, 2002 (INB) &horbar; En una encuesta hecha por Study Saint a 7,000 estudiantes y profesores del lenguaje Ingles, el EnglishClub, de acceso libre 100% fue clasificado como Numero 1 entre los 10 sitios mas destacados de Internet EFL/ESL . Mathew Ridyard, inventor de Study Saint organizador de Internet para alumnos de Ingles, presento el premio Golden Halo para el "Mejor Sitio del Mundo de Lenguaje Ingles" al fundador de EnglishClub Josef Essberger, diciendole: "¡Felicidades! EnglishClub ha sido votado de forma aplastante como la opcion mas popular de los usuarios de Study Saint. De una encuesta total de 7.000 votos, EnglishClub fue elegido por 28% de los votantes. Un logro notable. A los participantes de la encuesta on-line se les pidio que eligieran su sitio Web EFL/ESL favorito y que agregaran comentarios como estos: "EnglishClub siempre es mi amigo confidencial. Cuando tengo problemas con el ingles... voy a este sitio a buscar informacion y a estudiar." "EnglishClub no es solamente algo excelente para los alumnos, sino que tambien tienen buenos consejos para jovenes profesores como yo. "El Ingles me cambia la vida. Sigue practicando Ingles. Todo sera mas diferente que antes. Confia en mi y cree. ¡Si no estas en EnglishClub te quedaras atras!" "EnglishClub es como el cielo para todos los estudiantes de ingles del mundo." Fundado en 1997 por Josef Essberger, un escritor/fotografo proveniente de Inglaterra y profesor de RSA/TEFLA con 10 años de experiencia enseñando ingles en Europa y Asia, EnglishClub es un sitio de Cambridge, Inglaterra que rapidamente se ha convertido en uno de los sitios de instruccion de ingles lider en el Internet. "Pienso en EnglishClub como un verdadero 'club' que pertenece al visitante, donde se puede participar on-line en un ambiente amigable que estimula el 'aprendizaje por hacer'," dice Josef Essberger, quien no ve ningun conflicto entre los sitios gratis on-line como EnglishClub y las escuelas y los editores convencionales de idiomas. "De hecho, animamos activamente a principiantes que desarrollen sus habilidades en escuelas de idiomas a traves de las paginas como el Directorio de las Fiestas de Lenguas de EnglishClub. Y muchas escuelas y editores del ELT patrocinan a EnglishClub porque alcanza a principiantes de ingles en practicamente todos los paises. Veo como EnglishClub proporciona un genuino ambiente para querer aprender ingles. Me he esforzado en hacer este un sitio con un contenido verdaderamente educativo que siga siendo facil y divertido de utilizar. El enfasis esta mas bien en el principiante que en el profesor, al aprender, no enseñar." EnglishClub tiene 24 secciones principales que cubren las cuatro destrezas lingüisticas mas la gramatica, vocabulario y pronunciacion, igual que areas interactivas como eFriends (eAmigos), Foro y Chat, y secciones especiales para profesores. Su Centro de Asistencia (HelpDesk) de 24 horas es algo muy apreciado por alumnos que envian preguntas on line de gramatica y cuyas respuestas reciben de los Profesores del Centro de Asistencia (HelpDesk) como Alan Bunyan en el Japon o Sandra Goronas en Argentina. Uno de sus servicios mas populares de e-mail es "7 Secretos para Estudiantes EFL/ESL". EnglishClub atrae a mas de 120,000 visitantes al mes, registrando unos 1.5 millones de visitas. EnglishClub ofrece más de 5.000 páginas, convirtiendo esta web en uno de los sitios líderes para la educación de idiomas tanto por la calidad del contenido, el tamaño, formato y popularidad desde su lanzamiento en Noviembre 1997. Actualizado a diario, esta web recibe más de 70.000 visitantes cada mes que visualizan más de 400-000 páginas. Ha sido diseñado tanto para estudiantes y profesores del Inglés como segunda lengua y como idioma extranjero. "Pensamos en esto como un 'club' - no una 'escuela' - donde tanto estudiantes como profesores de Inglés alrededor del mundo pueden aprender Inglés en un ambiente ambigable que anima a la participación," explica Josef Essberger, fundador. "Hemos hecho un esfuerzo enorme para crear EnglishClub con todo el contenido educacional. También está lleno de páginas de acceso fácil que no requieren ningún software. Eso explica porqué hay miles de sitios en el ámbito mundial que tienen un enlace hacia nosotros." o Grammar - La zona más popular, ofrece ayuda y tutoriales sobre cualquier cosa, desde tiempos hasta preposiciones. o Vocabulary - Buenos ejemplos "de la vida real" de 20 palabras/definiciones habitualmente asociados con varias industrias y temas (por ejemplo, publicidad, edición, curriculum vitaes). o Reference - Una biblioteca extensa cubre las reglas del Inglés, verbos irregulares, etc. También ofrece varios tests de Inglés en distintos niveles para atestiguar tu progreso. o Business - Perfecto para el profesional o estudiante adulto que necesita información sobre temas económicos, novedades/seminario y consejo sobre cómo crear curriculum vitaes y presentaciones. o Teachers' Room - Una zona nada estresante para profesores atareados donde encontrarán actividades para las clases y otros recursos. o Language Holidays - Una extensa base de datos sobre escuelas que ofrecen cursos de Inglés como "estudios en el extranjero". o Fun - Acertadamente llamado Diversión, aquí se encuentran juegos de palabras, preguntas-y-respuestas y chistes. o Forums - Utiliza tus crecientes conocimientos del Inglés haciendo chats en Inglés o únete a un diálogo con nuevos amigos, o encuentra amigos por correspondencia de cualquier parte del mundo. o Shop - Verás miles de libros, CDs, cintas, vídeos y otros materiales elegidos cuidadosamente para ayudarte a mejorar tus conocimientos del Inglés. Además pueden los miembros apuntarse para recibir de manera gratuita el boletín del EnglishClub, "Progress! ", lleno de artículos interesantes, ideas para los estudios online y preguntas-y-respuestas. El sitio también responde a preguntas individuales de los miembros así como sobre el idioma Inglés e Internet, y ofrece un buscador personalizado para encontrar otros sitios relacionados con la enseñanza y el aprendizaje del Inglés. Ya que EnglishClub se dirige desde Cambridge, Gran Bretaña, el sitio está escrito en Inglés "Británico" y usa el diccionario The Concise Oxford Dictionary of Current English como referencia principal. "Sin embargo, también tenemos páginas relacionadas con otras variaciones del Inglés," explica Essberger, añadiendo que, por ejemlo, Webster's New World College Dictionary, es la referencia primaria para el Inglés Americano. EnglishClub es un sitio independiente que está siendo operado por su propietario, Mr. Essberger, un escritor/fotógrafo con más de diez años de experiencia enseñando el Inglés como segundo idioma y como idioma extranjero para todas las edades y niveles tanto en Asia como en Europa. La financiación de la web se obtiene gracias a la publicidad y venta de productos de la tienda online.